Marketing materials are only useful if they're seen. 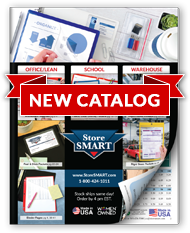 Don't let your brochures and other promotional items languish in storage—put them to work for you by using StoreSMART's Peel & Stick Literature Boxes! Each box is designed to hold brochures and features three strips of white foam adhesive that allow you to stick it on almost any clean, flat surface. Place one on your cash register or window, include one as part of a convention display, or use them in your office to make refilling your briefcase easy. These boxes are an effortless way to put your contact information right under your next client's nose. Crafted of clear, rigid 15mm plastic. Three strips of white foam adhesive help you construct the box and adhere it to a clean, flat surface. Overall size: 6" x 5" x 1 ¼". File Jacket with Peel & Stick Removable Strips - 11" x 17"